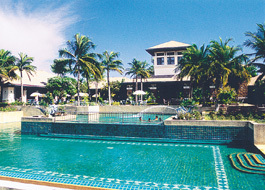 The resort's hospitality and the area's crystal-clear water and white, sandy beaches impress visitors. The one- and two-bedroom villas are complemented by a clubhouse with an elegant lakefront restaurant. Among other amenities are an indoor basketball court, badminton, aerobics, steam room, herbal sauna, hot tub, and children's facilities. Phuket offers several golf courses, a variety of water sports, shooting range, elephant and horseback riding, and island day-trips. Nightlife includes spectacular shows and cabaret entertainment.